Palliative Care Needs, Intellectual Disability, Multi-Morbidity, Carers, End Of Life Care and Inequalities. Advances in public health and social care have enabled people with an intellectual disability (ID) to live longer than ever before providing new challenges in understanding not only how people are living with illness but also how they are dying. What is known is that when compared to the general population, people with an ID have higher mortality rates, higher multi-morbidity rates and higher prevalence and earlier onset of Alzheimer’s disease and dementia. Carers frequently report that delivering high quality end of life care for people with an ID is an important, if unrecognised, element of their work and one for which they sometimes feel inadequately prepared for. Understanding the training and support needs of all staff, including palliative care staff and ID support staff is crucial to understanding care provision. This research project is part of the Intellectual Disability Supplement to The Irish Longitudinal Study on Ageing (IDS-TILDA). Using the IDS-TILDA as the sampling frame, the aims of the study were to: (1) develop a demographic, health status, and healthcare utilisation profile of participants in IDS-TILDA who had died between October 2010 and January 2015 and (2) explore the experiences at end of life for those who died, as reported by their carers. This study used a mixed methods approach, incorporating both qualitative and quantitative data collection and analyses to advance understanding of end of life care of older adults with an ID in Ireland from the perspective of their carers (n=37). ‘Carers’ refers to family members (n=1, 2.8%), and/or staff members (n=36, 97.2%) who supported the person with an ID at the end of their life. Of the 57 participants who had died almost all had a moderate (n=26, 50%) or severe/profound (n=25, 48%) level of ID. A validated questionnaire on carer perspectives of end of life care formed the basis of a semi-structured interview which was the primary data collection tool. Twenty-eight carers completed the semi-structured interview and thematic content analysis. While the findings of this study are drawn from a nationally representative sample of people with an ID there are challenges in claiming generalizability in such a small sample. However, using a mixed methods approach and data from IDS-TILDA (a nationally representative study of older adults with an intellectual disability aged 40 years and over) the validity for some of quantitative and qualitative results was cross checked. Theme 1 - Not joining up the dots identified gaps in care for the person including a lack of advanced care planning, poor pain management, transitions and health care professionals not understanding the needs of individuals with IDs. A lack of preparedness or awareness that the person was approaching end of life also emerged. Theme 2 - Living the life desired in one’s last days identified the critical role carers play in maintaining the personhood of the person with an ID into their final hours. 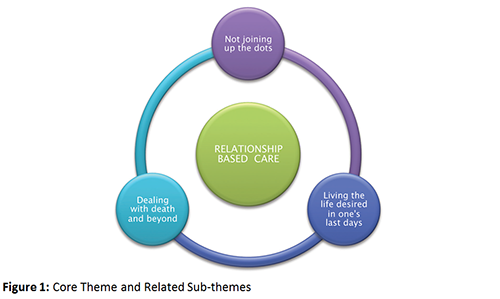 Knowing the person, their story and what was important to them formed the ‘bed rock’ of care provided at end of life. Theme 3 - Dealing with Death and Beyond - identified the role carers played in supporting family, residents, friends and staff to pay their respects. Also it identified practices and traditions implemented to preserve the dignity and memory of the person with an ID. While there was considerable richness in the qualitative data gleaned from the End of Life Interviews there are still questions to be answered. Research that helps identify conditions and related symptoms that are potentially terminal for people with ID will both advance efforts to prevent avoidable deaths and will also increase the likelihood that needed conversations about planning for end of life will begin earlier, palliative options will be introduced, and there will be time for greater collaboration between ID services, families, palliative care services and the person with ID themselves. There also needs to be work on the development of protocols and pathways to support the sensitive implementation of such care planning and delivery. The growing population of ageing people with IDs in Ireland has important implications for service provision and policy formation going forward. While the qualitative analysis of the interviews identified examples of high quality end of life care including collaboration between ID services and palliative care providers, involvement of family, staff carers and the person with ID themselves and good cooperation with GPs and hospitals. Overall the findings from this study confirmed previously reported inequalities for people with an ID at end of life. Several of the respondents recognised that the stereotyping of people with ID still exists. This results in not being able to see the illness from the person and being blind to possible underlying symptoms. This study identified gaps in the care of person with ID. Disjointed relationships between the intellectual disability services and general health services existed and communication challenges affected the quality of care provided at end of life, particularly in relation to pain management, decision-making about end of life care, and emergency hospital admissions. Findings from this study indicate that carers in intellectual disability services in Ireland are providing high quality end of life care to support a good death, however they often feel out of their depth. A lack of staffing and availability of appropriate resources poses challenges. There is a need 1) for end of life care training for staff with specific emphasis on the unique care for people with an ID has emerged, as well a need for increased collaboration with specialist palliative care services; 2) to better understand and support care and participation by families when the person no longer lives in the family home and 3) to define what good care is for a dying person with ID. Enabling and empowering people at end of life calls for preparation, conversations and planning, which were often but not always present in this research. Principal Investigator: Prof Mary McCarron, Dean of Health Sciences, School of Nursing & Midwifery, Trinity College Dublin (TCD) and Prof Karen Ryan, Clinical Associate Professor, UCD; Palliative Medicine Consultant, Mater Misericordiae Hospital & St Francis Hospice; & Clinical Lead for Palliative Care, HSE. Project Team: Dr Eilish Burke, Dr Patricia White, Claire O’ Dwyer, Janet Claire O’Farrell and Prof Philip McCallion. McCarron, M., Burke, E., White, P., O Dwyer, C., Ryan, K., O Farrell, J. and McCallion, P. (2017). “He’d mind you, you mind him” Experiences of end of life care for people with an intellectual disability as perceived by staff carers, 1-63.